A catalytic converter sometimes also known as a CAT is a vehicle emissions control device that converts harmful pollutants into less harmful emissions before they leave the exhaust system. Catalytic converters today are “three-way” converters reducing nitrogen oxides, carbon monoxide and unburden hydrocarbons into carbon dioxide and water. 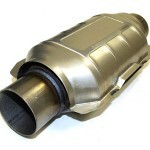 Catalytic converters in cars use two different types of catalysts; a reduction catalyst and an oxidation catalyst. These catalysts oxide pollutants of the exhaust stream through a honeycomb structures. Common problems for a failing CAT are; overheating, matrix contamination, or a clogged CAT. Our experience North Attleboro Auto Repair technicians have been installing catalytic converters on cars, vans and trucks since the 70s. Our commitment to quality is air and the reduction of pollutants is paramount.